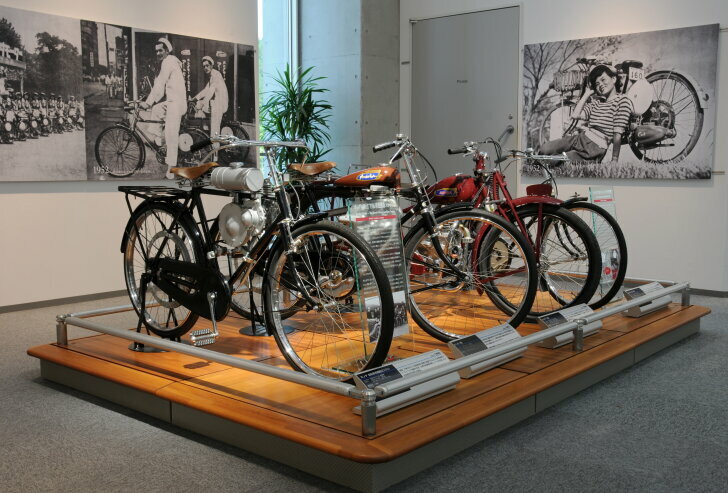 Motor museum | "Motegi" is a tiny village about an hour's drive from Tokyo. Tens of thousands of people visit this rural place every year. And for a good reason: the "Twin Ring" racetrack is located near Motegi. This track was build by Honda to introduce "Indy Car" racing to Japan in 1997. Also, this circuit is the home of the "Honda Collection Hall", where the history of the brand is shown. Autozine paid a visit. When entering the "Honda Collection Hall" one faces a big circular artwork. It is a piston ring, because that's what Soichiro Honda's very first company sold. His first business wasn't very successful and at the age of 30 Honda decided to go back to school and learn how it was properly done. The first product from the company that is now known as "Honda", was a bicycle with an auxiliary engine. This bicycle from 1946 used a surplus army generator for an engine. One year later the first motorbike followed, appropriately named "Type A". From then on Honda was unstoppable. The "Type C" (1949) won its first race. "Type E" (1951) was the first motorcycle with a four-stroke engine, setting the tone for innovative products. Honda products soon found their way to industrial appliances (1953) and in 1958 Honda built its first car. The Honda "N360" (red car on the left of the panoramic photo) was Honda's big commercial breakthrough. The N360 was powered by a motorbike engine and was the first front-wheel drive compact car. 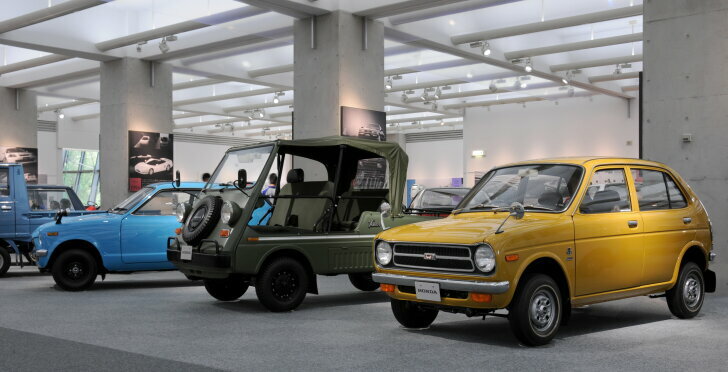 In the early years Honda focussed on small cars. Even the commercial vehicles were cute and cuddly, as proven by the "Vamos" which, despite the army green paint, is in fact a leisure vehicle. Honda's fascination with fast cars dates back to a visit to a racetrack at an early age. That is why motor spots have always played an important role at Honda. 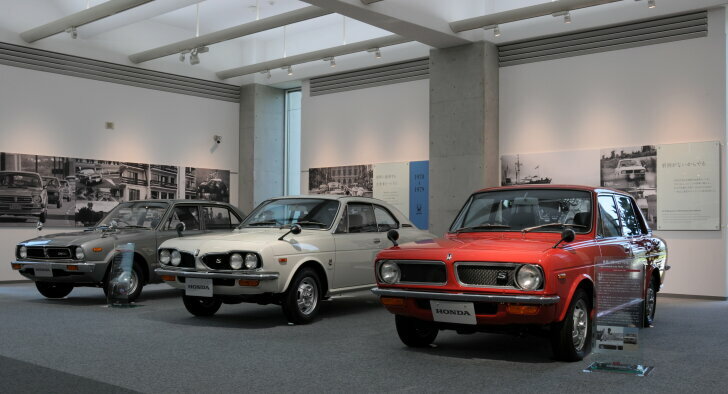 Almost simultaneous with the first luxury car, Honda developed its first sports car. Since motor sports are so important to the brand, the top floor of the museum is entirely dedicated to racing bikes and cars. 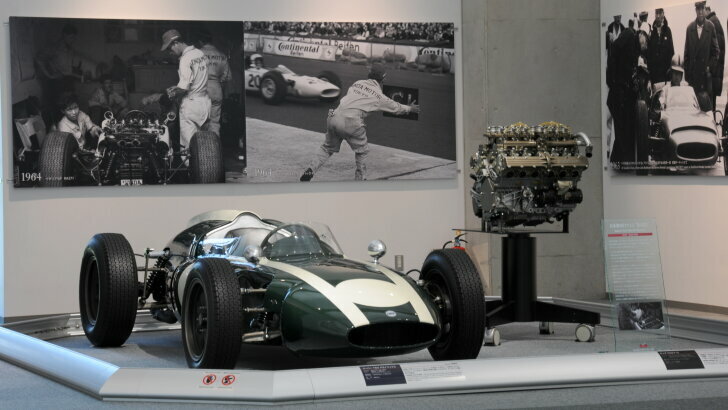 The centrepiece is the "Cooper T53 Climax" (1961) which, according to Honda, is the predecessor of the modern Formula-1 car. The Honda "Life" was the succesor to the N360 and the first Honda with a water cooled engine instead of an air cooled engine. To date, the name "Life" is still used by Honda in Japan. With the "Accord" Honda also offered a larger car. The version from 1976 on display featured very advanced technology ("CVCC") for that time to comply with environmental law. Following in 1985, the Accord Aerodeck introduced striking aerodynamic lines which also benefit efficiency. The car that is known as "Jazz" in Europe, is sold in Japan under the name "City". Thanks to a generous donation by a customer, the Collection Hall now owns one of the very few City Convertibles ever made. The City Cabrio is only the second Honda convertible, after the S800 from the 60s. Autozine's favourite is the sympathetic "Beat" (1991). This tiny (yellow) vehicle is a so-called "kei car" and is therefore exempt from most taxes in Japan. To comply with the rules (engine of no more than 660 cc) the Beat uses relatively expensive technology and was therefore never sold in Europe. The Beat is in fact a fully blown sports car with a mid ship engine and rear-wheel drive. In the 80s and 90s Honda was successful with larger and more sporty models like the "NSX" and the "Legend". 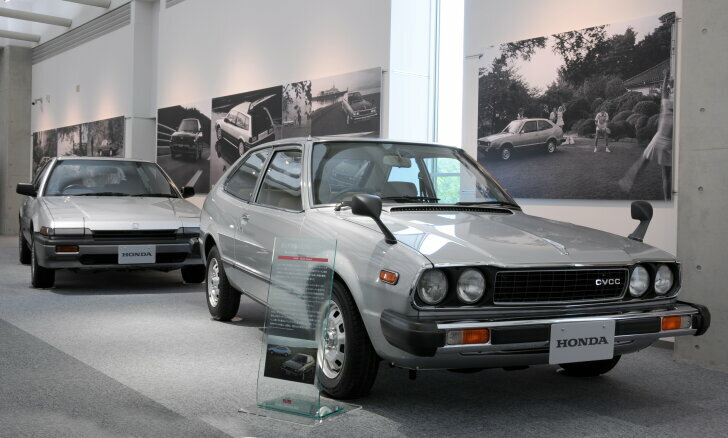 The example shown in the museum has actually been used by Mister Honda himself as a company car, until he donated it to the Collection Hall. Just like this Legend, most cars and bikes on display are ready to roll. 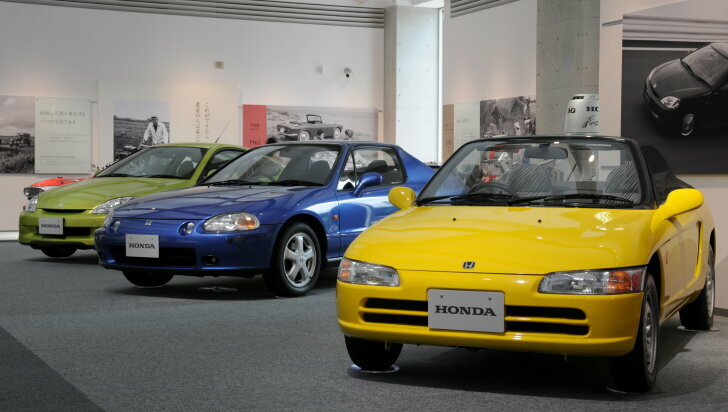 From recent history the first Honda "Insight" (1999) and "CR-X Del Sol" are shown. Both have been tested by Autozine during its early years (Dutch edition only). This point marks the end of the museum tour as being the beginning of the digital age. Honda also plays an important role in the digital age with a robot named "Asimo". Honda's aim is to make robots part of every household. This is why a robot should not be threatening and should look like a human. The first prototype dates back to 1986 and is no more than a mechanical pair of legs. 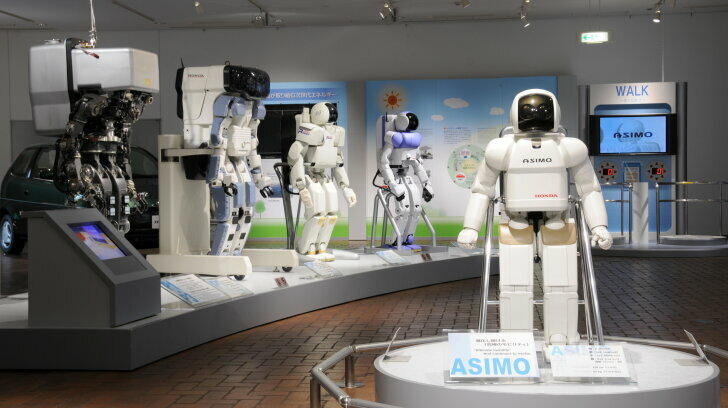 This explains the name "Asimo", which means "legs also" in Japanese. In time Asimo became more like a human being. The world's most advanced robot got a face, shrunk to a child-size person and can move with amazing ease. Twice a day the latest generation of Asimo shows its abilities in its own theatre on the ground floor. Even those who don't understand a single word of the 100% Japanese presentation will still be impressed. Near the rural Japanese village of "Motegi" a racetrack can be found. However, there's much more to see than just fast cars. As the name "Twin Ring" implies, it consists of both an oval and a traditional racetrack. Within the racetrack there's even a small theme park where children can drive all kinds of vehicles. 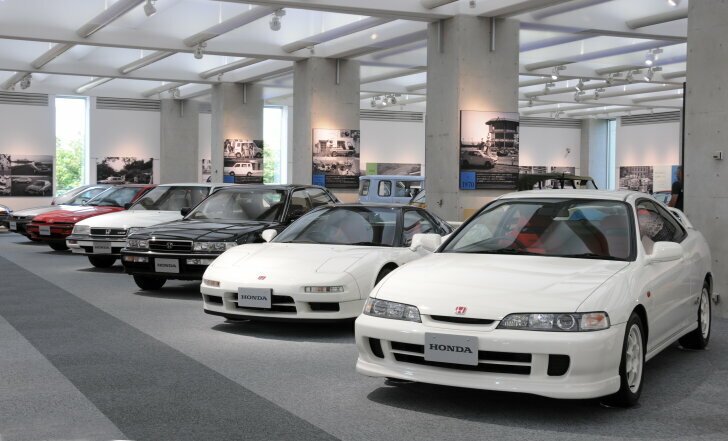 Another good reason to go to the "Motegi Twin Ring" is to visit the "Honda Collection Hall". This modern, three-storey building shows the past, present and future of Honda. The collection consists of some 3,000 objects (including helmets, brochures, etc.) of which 50 cars and 200 motorbikes are on display. All documentation is available in both Japanese and English. Admittance is free and foreign vistors receive a warm welcome. Or to quote two diehard Honda fans from the USA: "the souvenir shop alone is worth the long journey".